Do you want complete freedom to choose what to do and not do? Do you want to be the master of your own destiny versus have someone else in control? Do you want to leave that stressful job that’s slowly sucking the life from you? 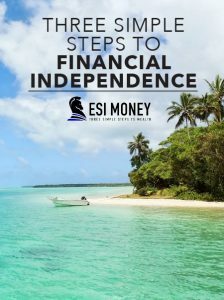 My new, completely free ebook, “The Three Steps to Financial Independence”, details the few, essential steps to become financially independent. And when you become financially independent, you begin to call your own shots. You begin to make decisions based on what you want to do instead of what you have to do. You throw off the yoke of taking orders from others and become the complete master of your time and money! Sounds great, doesn’t it? Believe me, it is. Heard Enough Already? Want the Book before Reading Another Word? Provide your email below to receive a free copy of “Three Steps to Financial Independence”. When you do you’ll also receive email tips and tactics for becoming wealthy! I have been financially independent for over a decade and recently decided I’d had enough. Up to that point, I liked my job. But events conspired against me and I needed a change. Being financially independent allowed me to say “so long” without a worry. I retired officially and haven’t looked back for a second. The book details my tried and true methods from over 25 years of personal finance experience. I am not a financial adviser or money professional of any kind. Heaven forbid! Those guys most often simply want to make your money their money. I’m just a normal person who learned how to manage money by trial and error as well as study and focus. And the results speak for themselves. In those 25 years I have been able to accumulate a large net worth that has left me financially independent. It took me longer than needed since I tried a lot of things that didn’t work. Fortunately I tried many others that did work. And I’ve distilled the vital steps down to a handful — three simple steps anyone can take to become financially independent. You won’t have to learn by trial and error like I did. You can avoid my mistakes, apply these three, and reach financial independence in a much shorter time than it took me! The book has all the details you’ll need to reach financial independence and live the life you’ve always wanted. You will receive the free ebook by simply providing your email address below. In addition to the book, you’ll receive a notice every time I publish new and creative tips for helping you get to financial independence even faster. I know you’ll love the updates, but if you don’t you can cancel easily with two clicks. But why do that when I’m telling you how to earn, save, and invest your way to being the master of your money? So sign up using the form below and you’ll be well on your way to financial independence! Begin Your Journey to Financial Independence Today! Provide your email to receive a free copy of “Three Steps to Financial Independence”.